Speedway is an awesome store. They sell $200 OneVanilla cards that can be purchased with a credit card, they give away free stuff every month, and they have a reward system that can easily be taken advantage of, nevertheless, their new credit card seen above is one of the worst credit cards I have ever seen. At first glance or without knowing the Speedway rewards system, 50 points per dollar or even 10 points per dollar sounds great right? On Speedway’s part, that was a really smart idea, because many uninformed people will likely jump on this deal. However, if you take a step back and do the math, it’s very apparent that this deal is awful. 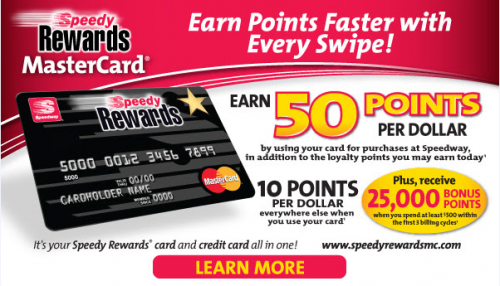 Speedy points can only be redeemed for food, drinks, and gift cards. There is no way to convert them to miles or cash, so the value there is limited. The starting redemption is 900 points. What can those 900 points get you? A bottle of water that normally costs $0.99. The first gift cards can be bought at 7,500 points (Speedway gift cards) and 10,000 points (store gift cards, so it’s safe to assume that 1,000 Speedy points equals $1.00. Now considering that 1 Speedy point equals 0.1 cents, let’s look at how much you could earn with this credit card. Let’s say you spend $400 on gas every month and you exclusively shop at Speedway thanks to this new credit card. If you redeem your points for store gift cards, you will get 0.1 cents out of each point (50 points = 5 cents). If you redeem for Speedway gift cards, you will get ~0.15 cents out of each point (50 points = ~7.3 cents). So, 20,000 Speedy points is equal to $20 in regular gift cards or $29.41 in Speedway gift cards. Obviously, redeeming for Speedy gift cards has an advantage here, but that doesn’t make this card worth getting. The fact that Speedy points cannot be redeemed as a statement credit or for cash, immediately diminishes their value (to me). It’s true that Speedy points can be redeemed at about 0.1 – 0.15 cents each, but just because they can be redeemed for a certain value doesn’t mean they should be valued that way. I personally value them at 0.05 cents each, because it can take a while earn enough for a gift card and I do not value store gift cards at face value. Why? Because, store gift cards cannot be turned into a cash equivalent. You will lose money even if it’s only 1 or 2 dollars. So, at 0.05 cents each, 50 points per dollar is only equal 2.5 cents worth of profit and we all know it’s very easy to get 5 cents per dollar at gas stations with other cards. Anyway, what’s the point of this post? Numbers may look good on paper, but do the math before signing-up, so you know what value you are actually getting out of a card.